The Survival Guides for Ballroom Dancers, Renovators, Softball Moms, Working Parents and Troubled Folk in General group exhibition is on at Middelberg’s Vleeshaal, opening July 2 and running to September 11. Martin Kohout, ‘Skinsmooth Hover Hand NEG’ (2015). Exhibition view. Courtesy Exile, Berlin. Header image: Laure Prouvost, ‘Stong Sory (Cake)’ (2005). Video still. Courtesy the artist + MOT International, London + Brussels. London’s Danielle Arnaud invites curatorial platform A- – -Z to curate a video screening event, Anathema, to act as a finissage for the gallery’s recent exhibition Ichor, on April 10. 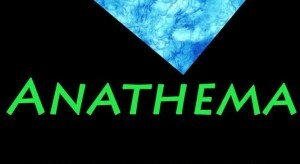 Anathema, which as a word was historically used to describe a curse banning and ex-communicating persons or doctrines from the Church, celebrates that which is consigned to damnation. Laure Prouvost, ‘Wantee’ (2013). Courtesy MOT International. The School of Kyiv biennale project is taking over the Ukrainian city in Fall, running at various locations from September 8 to November 11. With a multidisciplinary schedule of exhibitions, performances, film screenings, multimedia experiments and broadcasts, as well as workshops and research situations, the international biennale has invited artists, intellectuals and social initiatives, as well as institutions to participate in the affair. 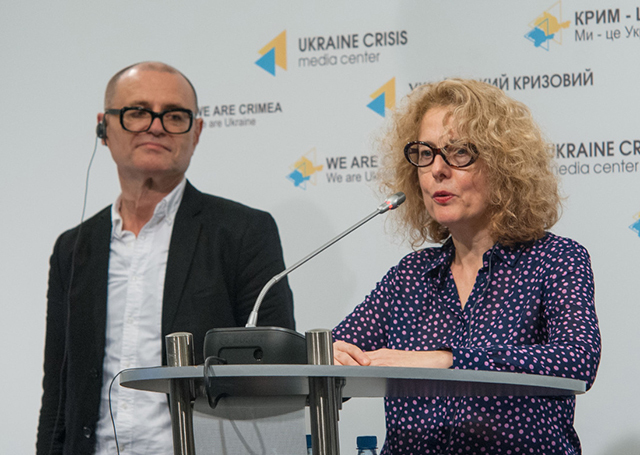 Curated by Hedwig Saxenhuber and Georg Schöllhammer, The School of Kyiv is organized into six “schools”, including: 1) “The School of Abducted Europe” with Sanja Iveković (Croatia); 2) “The School of the Displaced” with Milica Tomić (Serbia); 3) “The School of Image and Evidence” with Hito Steyerl (Germany); 4) “The School of Landscape” with Igor and Ivan Buharov (Hungary); 5) “The School of Lonesome” with Tony Chakar (Lebanon); and 6) “The School of Realism” with Doug Ashford (USA). The biennale will also include projects by Neil Beloufa and Laure Prouvost. To write an account of FIAC is to attempt to speak of parts within a necessarily unknowable whole. Were the whole visible from one’s perspective on street level, no doubt it would be truly terrifying. Thankfully, we’re not obliged to be all-seeing, in fact perhaps even the organisers would advise against it. La Foire Internationale d’Art Contemporain in Paris designates a four-day event whose object is art, galleries and exhibitions of a sort. Yet when someone says ‘FIAC’ (fyak! ), they tend to mean something much more englobing even than the majestic Grand Palais that houses the main stands. This year, FIAC introduced (OFF)ICIELLE, the ‘official satellite’ fair, whose purported purpose is to “showcase new territories: young galleries and newcomers to the international art scene; emerging artists and those whose historic contribution has been overlooked”. It was noted by more than once that, in actuality, the (OFF) – held in the less grandiose, more utilitarian venue Les Docks – Cité de la Mode et du Design – was a veritable salon des refusés. Which is to say it housed those galleries which applied for the main event but, for whatever reason, didn’t make the cut, suggesting that FIAC had cleverly maneuvered a cash cow on the back of younger, less established clients. That cynicism aside, (OFF) hosted some great galleries and artists, and its energy was slightly more welcoming, less high-maintenance than its older sister. 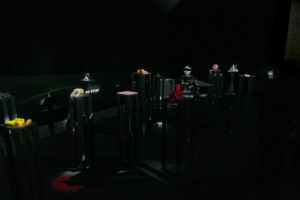 House of Gaga installation view. FIAC 2014. Courtesy the gallery. It’s worth mentioning, though there’s no space to go into detail, that besides these ‘official’ fairs there was also the fourth annual Young International Artists (YIA) art fair, held at the Carreau du Temple in the Marais. Which, thanks to the appearance of FIAC’s (OFF), became a sort of off-off. Here, works by USA-based Jon Bernad and French artists Loup Sarion and Eva Barto at La GAD (Marseille) were a highlight, as was Barcelona’s The Green Parrot. Each of the three fairs had outdoor or hors les murs projects, as well. There were many, many openings at galleries in Paris during FIAC week, including a great solo show by Latvian artist Daiga Grantina at Galerie Joseph Tang (she also appeared in Tang’s (OFF) booth, accompanied by Adam Cruces, Jo-ey Tang and others). And the ‘Gallery Night’ on Thursday 23 October saw spaces throughout the city opening until 10pm. Everyone makes an attempt to get a piece of FIAC pie, it seems, for you never know when a collector might just swan past and fall madly deeply for one of your stable. Even the day of rest, Sunday, saw the Belleville Galleries’ Brunch, where the array of young-ish spaces based in Paris’ Belleville quarter opened their doors. For someone who went expecting sweet patisseries and Nutella, the brunch itself was disappointedly meagre, however. Seemingly, everyone was hungover and would rather have been in bed. The Friday had seen the Ricard Foundation’s announcement of their annual art prize at the infamous bal jaune (yellow ball, named after the family’s eponymous pastis, one can only assume). More occasion for what became somewhat of a constant for many people from Tuesday’s (OFF) vernissage onward: drunkenness. Curatorial collective castillo/corrales curated the Prix Ricard show this year, with a fine selection of French artists including Mélanie Matranga, Audrey Cottin and Jean-Alain Corre. The winner was Camille Blatrix. In addition to all this folly, FIAC had organised substantial parallel programs of films, performances and conversations. The latter were conceived and orchestrated by Paris-based artist Alex Cecchetti under the title ‘Voices of Urgency’, with the final conversation event consisting of New York-based poet Ariana Reines, Paris-based sociolinguist Luca Greco and Slovenian poet Peter Semolič, reading around the topic of ‘desire and revolution’. 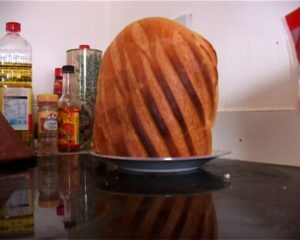 Earlier that day, Laure Prouvost had given the performance titled ‘Bread, Tunnel, Vegetable’ (2014), which involved a group of children offering tea, bum-shaped cakes, and crisps to the audience sat on the floor, while the London-based French artist dramatically recounted stories associated with her imaginary lost granddad. 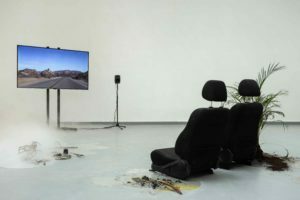 The performance falls within the expansive Turner Prize-winning project, ‘Wantee’ (2013), the video of which was shown on a laptop monitor during the performance. Berlin-based artists Pauline Boudry / Renate Lorenz showed two videos within the films program, ‘To Valerie Solanas and Marilyn Monroe in Recognition of their Desperation’ (2013) and ‘Opaque’ (2014), a film so recently finished that Boudry and Lorenz had not yet seen it projected. 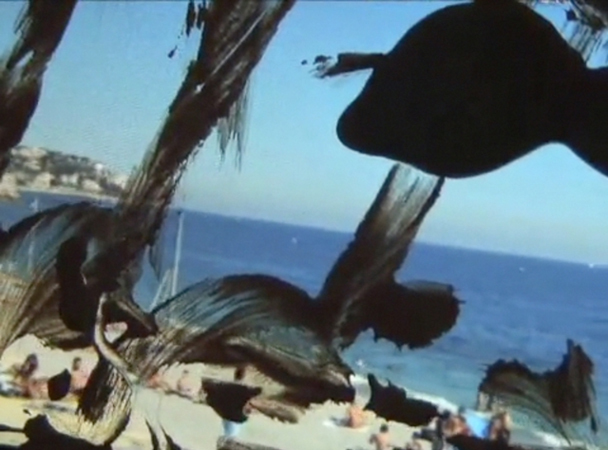 A discussion between the artists and French art historian Élisabeth Lebovici followed each film, with some of the primary concerns being non-hierarchical production (in film, and in Pauline Oliveros’ music), the camera as active participant in a performance that couldn’t exist without it, and opacity as resistance against the aggressive act of understanding. The veil is a recurring motif; the artists suggest we don’t need to see everything and it is misguided to think the camera reveals all. Pauline Boudry / Renate Lorenz, ‘Opaque’ (2014). Video still. Courtesy Ellen de Bruijne Projects. If only one didn’t feel the pressure to see it all! At the main event, expensively-dressed people shuffle around with glazed eyes, darting between 750,000€ Isa Genzkens, 9€ sandwiches resembling plastic, and Ruinart champagne. The most interesting booths were ones that pretended to be anything else but a luxury goods stall. Particularly successful were those who allowed one single artist to create a total installation, not only because it gave a more generous insight into the practice, but also because it was such a relief after the endless white. Perhaps unsurprisingly, two Berlin galleries were among the most adept at this technique. Isabella Bortolozzi Galerie’s Wu Tsang installation came directly from the artist’s solo show, A day in the life of bliss, held at the gallery this summer. One of the highlights of the season, they cleverly re-contextualised the work for an FIAC audience, turning the stand into a mirror-like infinity lounge and inviting people to sit and observe reflections of themselves and others – and of course the colourful flashing light sculpture which took prime position in the centre, hanging from above and almost touching the floor. Meanwhile upstairs, Kraupa-Tuskany Zeidler’s GCC installation included the HD video ‘Co-Op’ (2014), which ironically promotes a society based on luxury. 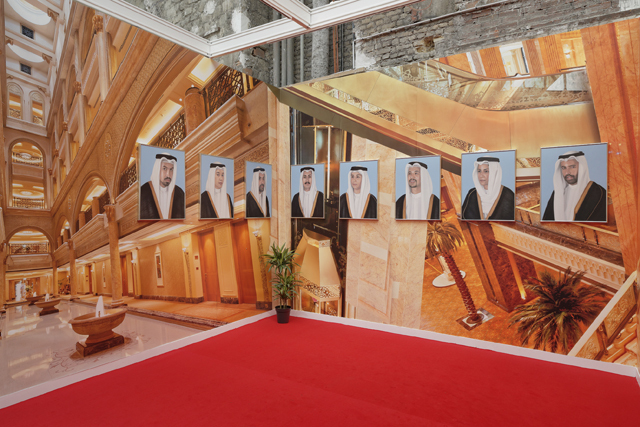 The flat screen is installed within ‘Royal Mirage’ (2014), where wallpaper depicting the luxurious interior of a multi-billion dollar hotel in the Gulf serves as the background to eight painted portraits, hung in an even line. GCC commissioned a Thai painter in Kuwait to create oil paintings of members of the collective in the same style he paints sheikhs. Depicted in thawb and in a typical soft-focus manner, signs of age or gender become indiscernible, and all eight artists fall under the category of ‘Arab’. Simultaneously a witty comment on the kinds of portraiture Western collectors might hang on their walls, the rising power of the Middle East, and the role of the artist as self-promoting brand, GCC really made the mirage work. 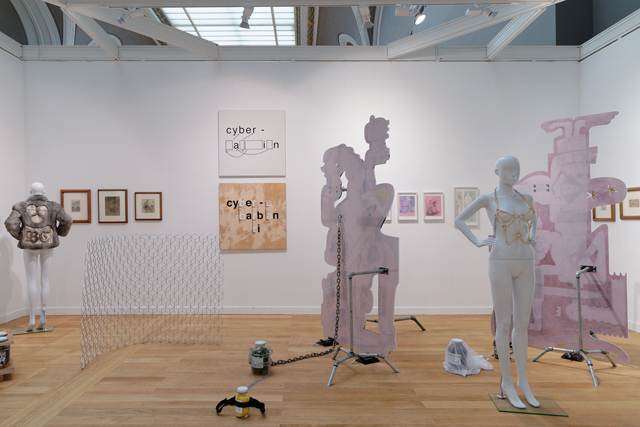 GCC installation view @ FIAC 2014. Courtesy Kraupa-Tuskany Zeidler. Other galleries went for the classic mixed-bag group show model, which inevitably meant the works on display ranged from the merely eye-catching to the quietly stunning, with little way of discerning the two, unless you mustered up enough energy to speak to one of the exhausted looking gallerists. Some gems among the Kapoors included French artist Lili Reynaud-Dewar’s dancing pyjamas encased in glass sheets, ‘Live Through That ? 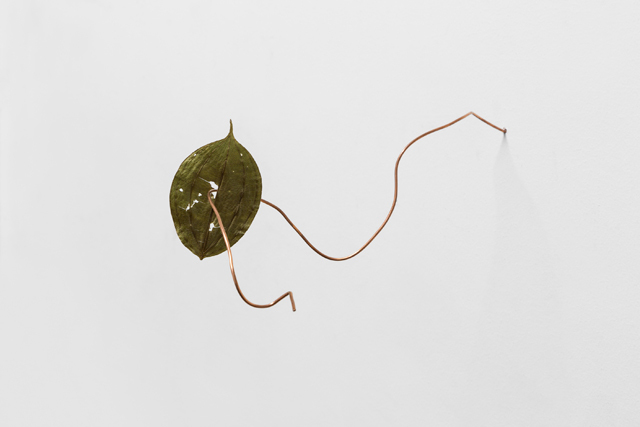 !’ (2014), at Kamel Mennour, London-based Eloise Hawser’s two pieces at Balice Hertling, young Romanian Mihuț Boșcu Kafchin at Gaudel de Stampa, Praz-Delavallade’s swathe of LA artists including Amanda Ross-Ho and photographer Matthew Brandt, and Galerie Antoine Levi’s display of Italian artist Francesco Gennari’s spiderweb photographs and US-American Sean Townley’s sculptures. In addition to all these Paris galleries, highlights from abroad included Mexico D.F.’s House of Gaga, whose pairing of New York-based Sam Pulitzer’s drawings and Mexican illustrator Julio Ruelas, who died of tuberculosis in Paris in 1907, made a link that gave a touch of much-appreciated sentimentality. Unexpectedly seductive, German artist Martin Eder’s painting at Leipzig/Berlin Galerie EIGEN + ART also spoke to the romantics amongst us, while New York’s On Stellar Rays had a wild display of Debo Eilers’ and Rochelle Feinstein’s colourful painting and sculptural works. Austrian-born artist Josef Strau’s tacky fence piece was a highlight at London’s Vilma Gold, and the Latin American stars Adrián Villar Rojas, Abraham Cruzvillegas and Gabriel Kuri at kurimanzutto, Mexico City, were predictably impressive. Meanwhile, Lisbon’s Vera Cortês Art Agency presented artists Joana Escoval and Daniel Gustav Cramer, whose understated pieces provided relief from the bombastic, ostentatious norm. Joana Escoval, ‘Outlaws in Language and Destiny’. 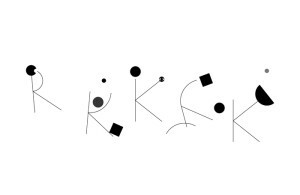 Courtesy Vera Cortês Art Agency. That’s a tiny, we’ll say refined, taste of FIAC before one even begins to rattle off some of the things to be seen at (OFF)ICIELLE. There, it’s worth mentioning Cynthia Daignault’s photographic and painterly meditation on images of the Matterhorn for New York gallery Lisa Cooley; British artist Merlin James’ solo show of his expanded landscape painting practice at Kerlin Gallery, Dublin; London-based Italian artist Salvatore Arancio at Rome’s Federica Schiavo Gallery alongside Jay Heikes; and Jacqueline Mesmaeker’s beautiful photo-sculptural installations at Nadja Vilenne, Liège. At Galerie Tatjana Pieters, Belgian artist Philippe Van Snick’s ten-colour palette and associated aesthetic limitations proved in reality to allow an ongoing multiplicity of forms and encounters. Andreas Angelidakis’s series of ‘bibelots’, 3D-prints resting atop internally decorated vitrines, at The Breeder (Athens) were a highlight. As was French artist Sarah Tritz at Paris Galerie Anne Barrault, whose work included a trashy fake-hair and bead sculpture and large collage of a seductively angled naked arse. Select arrow top-right for installation photos. FIAC (International Contemporary Art Fair) is an annual event running at October at Grand Palais.